It has been another dramatic weekend with schedule changes and extreme weather conditions disturbing proceedings. However, this morning the MotoGP paddock woke up to sunshine for the first time this weekend. 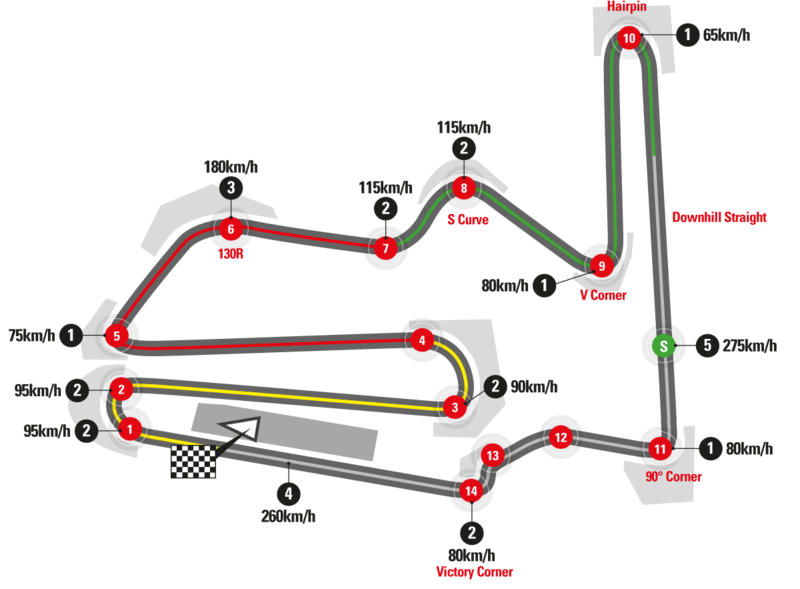 Once the early mist burned off, the morning Free Practice session was extended to 45 minutes as this was the only dry track time the teams had seen all weekend. 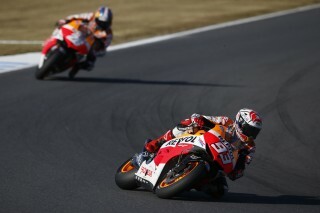 Marc suffered a high speed crash in the session on a cold front tyre and was fortunate to avoid serious injury – he received an injection before the race to numb the pain. Starting from 2nd (Marc) and 4th (Dani) on the grid, it was a fast dash into the first turn with Marc losing a place and Dani slipping back to 5th briefly. 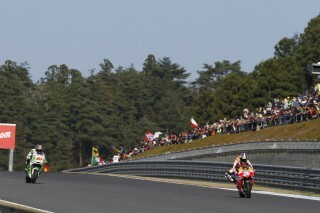 On lap two, Rossi made a mistake and both riders took advantage, closing in on pole man Lorenzo – leading the race. They rode in perfect formation with milliseconds separating them for the entire first half of the race. 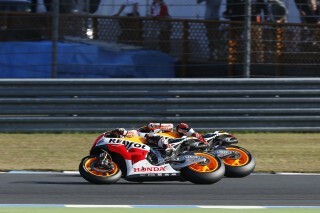 Dani started to lose touch with Lorenzo and Marc as they opened up a small gap. 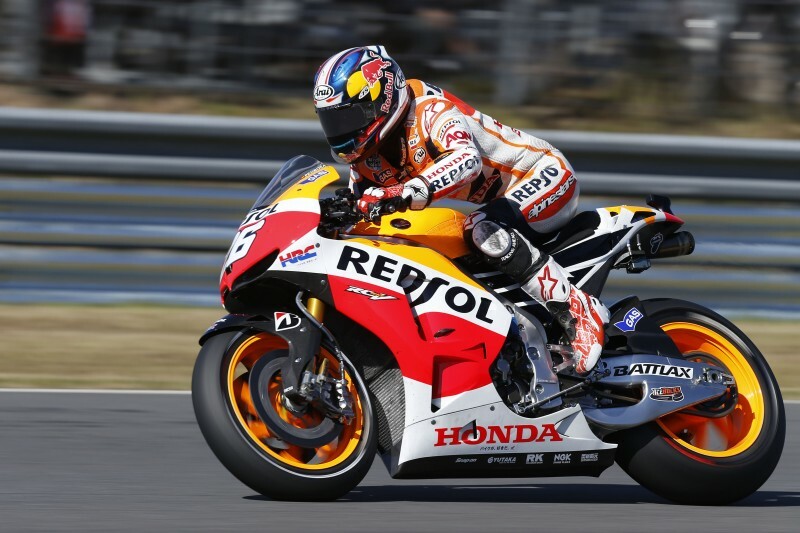 Having only experienced 45 minutes on a dry track at Motegi on the MotoGP machine, Marc was starting to have some issues. 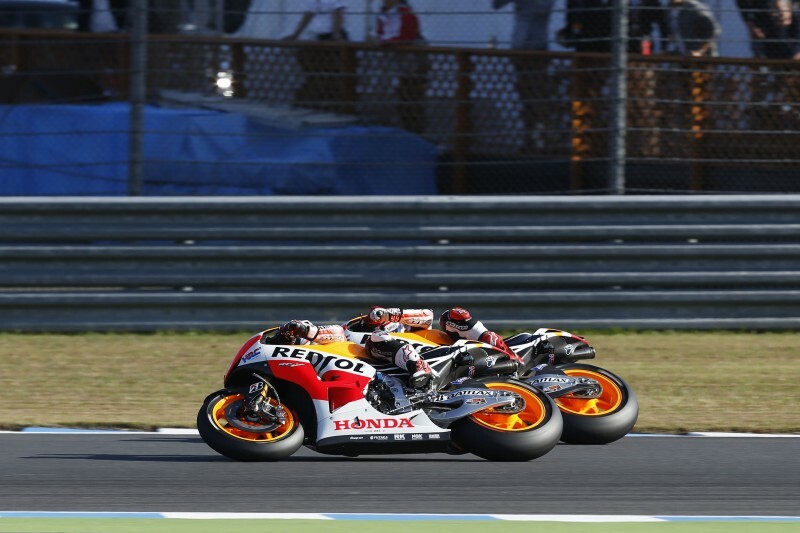 He attempted a few moves on Lorenzo but was unable to complete a pass and finally stopped pushing and settled for second place and important Championship points. Behind the podium finishers, Gresini’s Alvaro Bautista and LCR’s Stefan Bradl took 4th and 5th, delivering Honda four bikes in the top five. Dani’s 3rd position now mathematically rules him out of the Championship chase, but Marc’s 20 points leaves him 13 ahead of title rival Jorge Lorenzo with just one round remaining of the 2013 season. 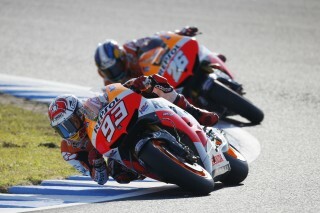 The Valencia GP in two weeks time will be the title decider – the first time the title has gone down to the last race since Nicky Hayden in 2006, when he won the title for Honda. 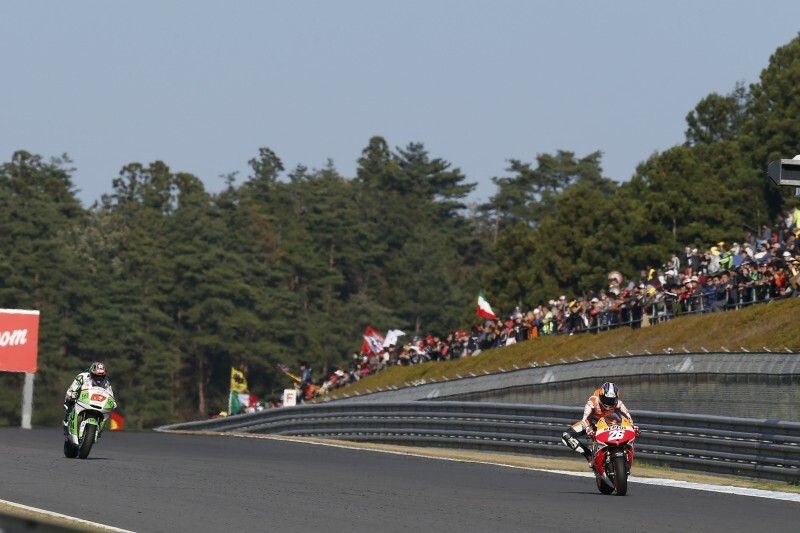 With the 2nd and 3rd places in today’s Japanese GP the Repsol Honda Team have clinched the 2013 Teams Championship. 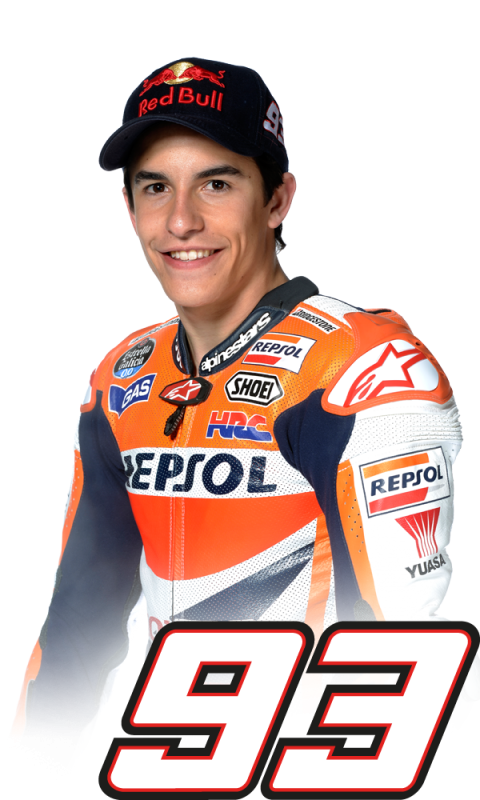 Scoring a total of 598 points, the team are now 69 points ahead of their nearest rivals with only 45 to play for in Valencia. 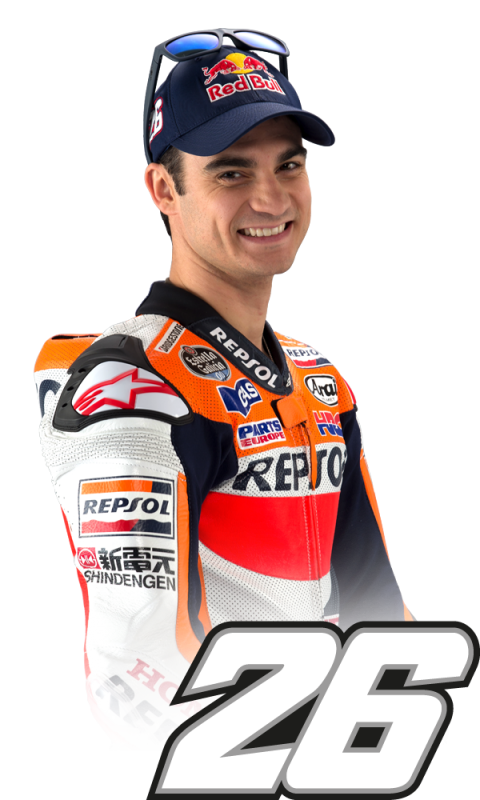 In total this season to date, Marc has scored a total of six x 1st’s, six x 2nd’s, 3 x 3rd’s and 2 x DNF’s. Dani has scored 3 x 1st’s, 6 x 2nd’s, 3 x 3rd’s, 2 x 4th’s, 1 x 5th and 2 x DNF’s. The team has celebrated 5 x 1-2 finishes and 10 x double podiums. “Second place today is a very good result. After my crash in warmup, I knew that it would be difficult to be consistent - because in the morning I hadn't managed that either. This was my first time at this track with a MotoGP bike and in practice I was unable to get any references in the dry, leaving me with only the warmup and the race in which to find my way. I saw that Jorge was a little stronger than us here and I had a couple of scary moments, making me decide that twenty points and the gap being reduced by only five points would be a decent result. There is only one race remaining - the most important of the year - so we shall try to be more focused than ever at Valencia"